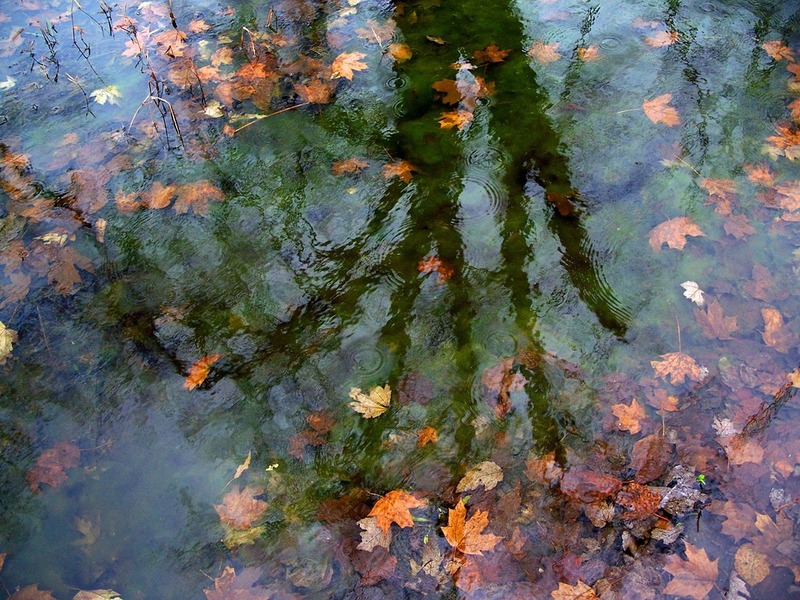 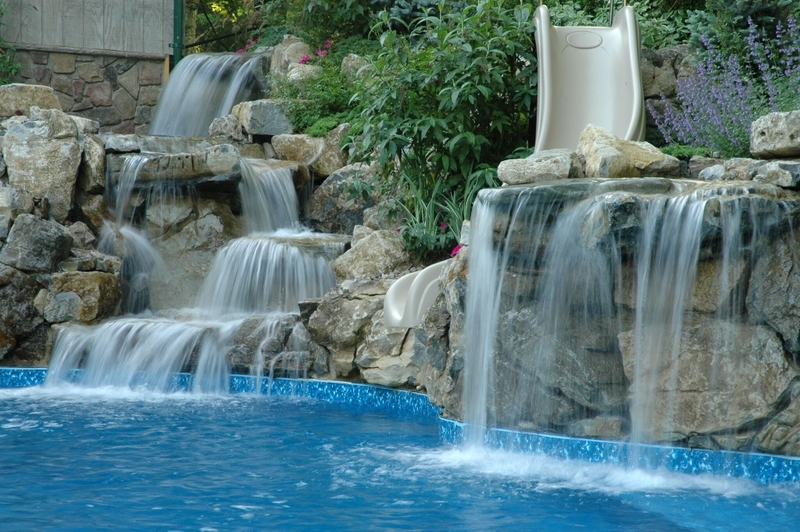 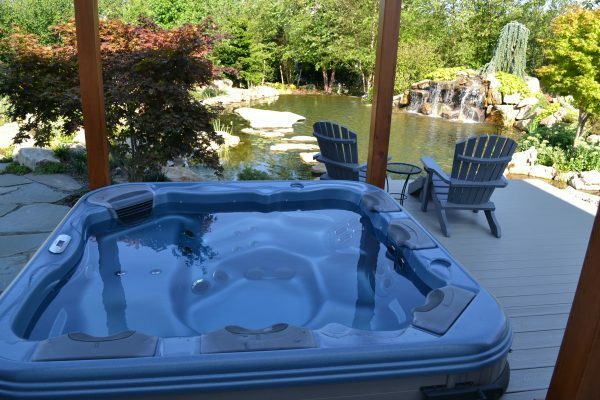 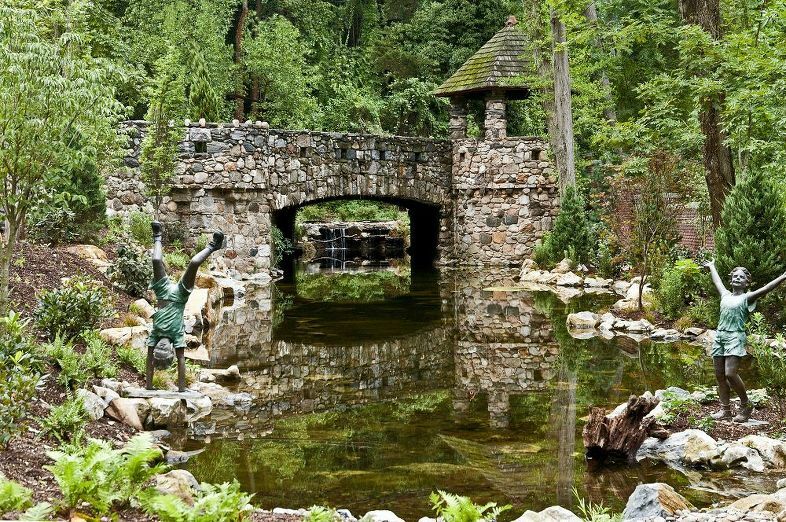 It’s true: the sounds and sights of moving water turn any property into a restful escape. 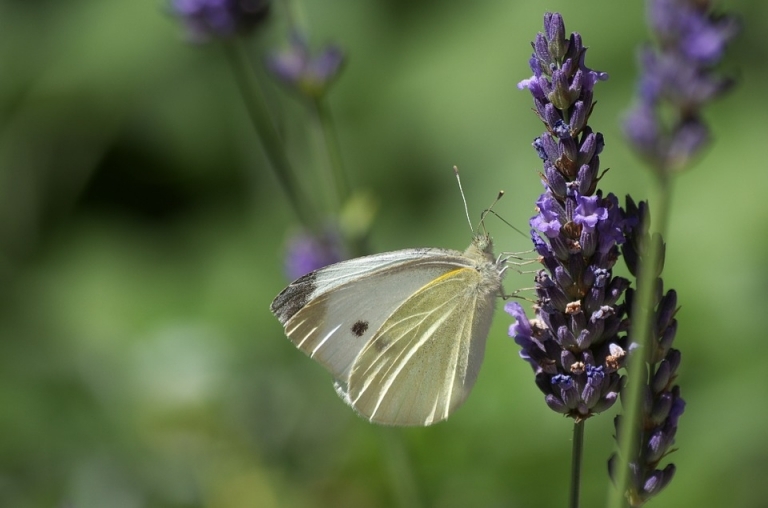 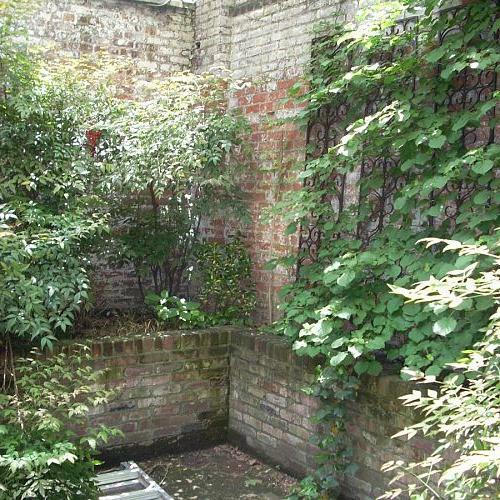 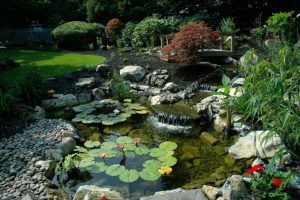 But ponds and pond-less water features can also include rainwater harvesting components — offering a great way to save water and aid the local ecology. Such rainwater harvesting systems support all types and combinations of water features — fountains, waterfalls, ponds, streams. 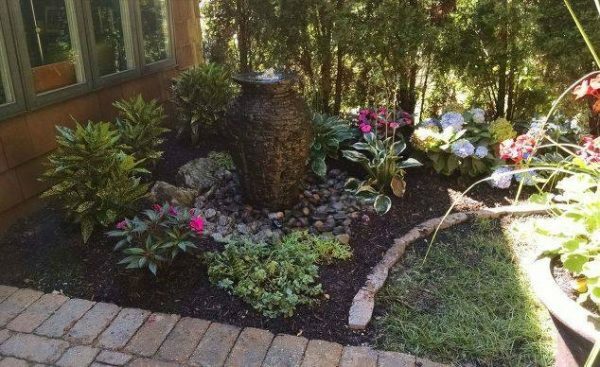 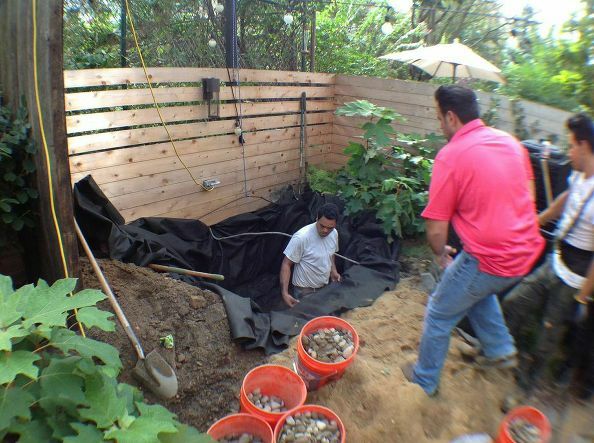 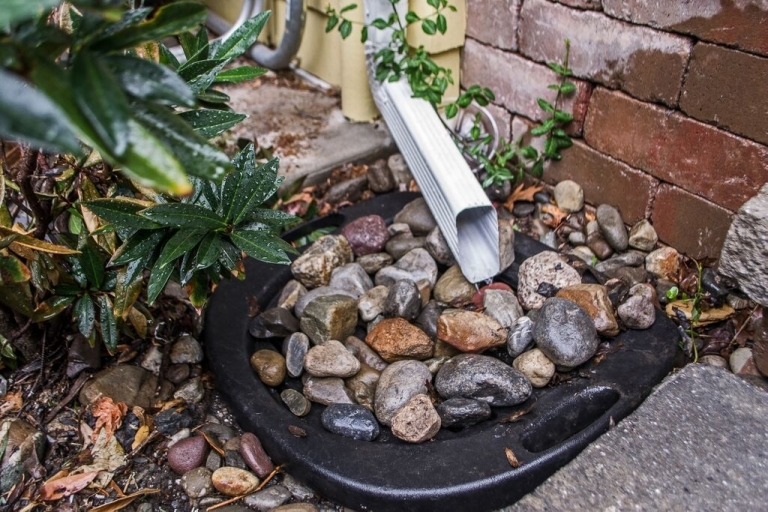 The captured rainwater can also replenish a water feature’s surrounding landscape, wash a car, rinse down a deck or patio, etc., and it is especially helpful during droughts. 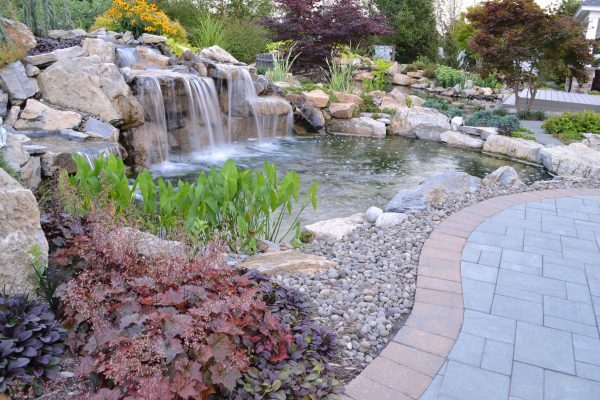 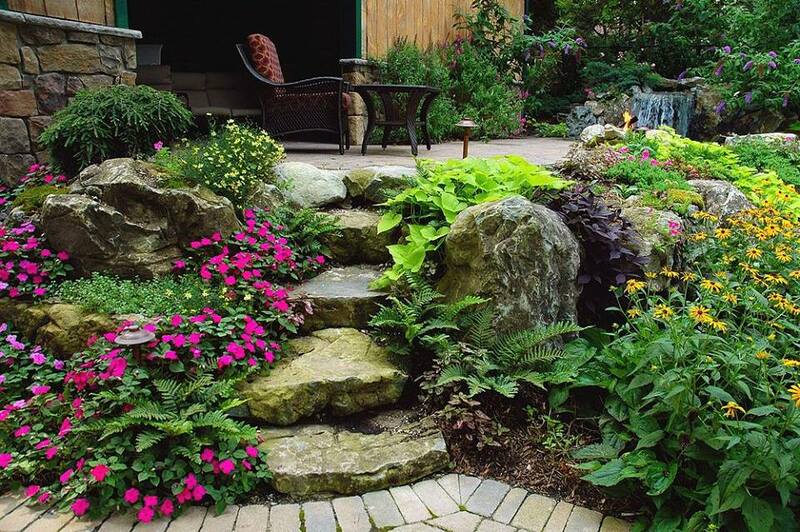 As certified installers of renowned Aquascape Inc. products, the water conservation systems and other water garden products Deck and Patio uses are both technologically and biologically efficient. The Aquascape products Deck and Patio used for this project include high efficiency pumps, skimmers, biological filters, and gravel beds. 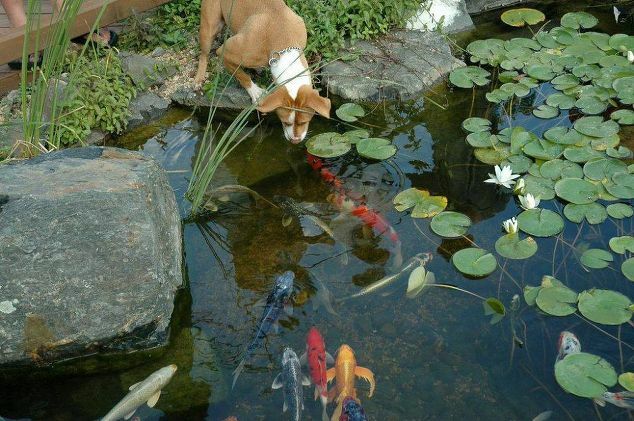 Note: Koi can also be a truly beneficial part of a pond’s eco-system, including this self-sustaining one. 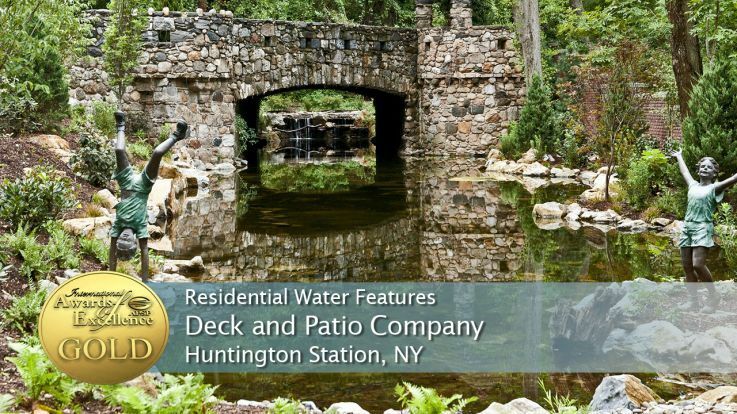 The Aquascape ‘green’ RainExchange process for this Deck and Patio feature combines a decorative water feature with a completely sub-surface collection system — thereby creating a beautiful backyard oasis that is very eco-friendly. 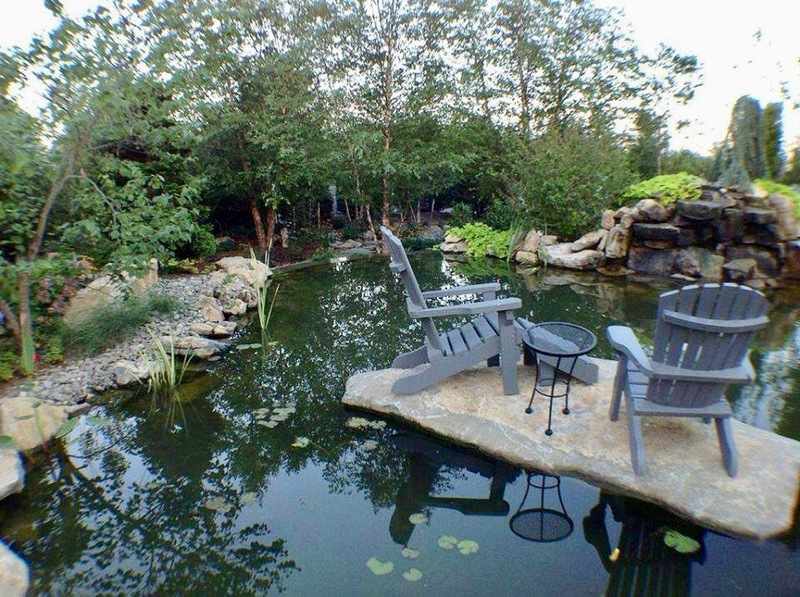 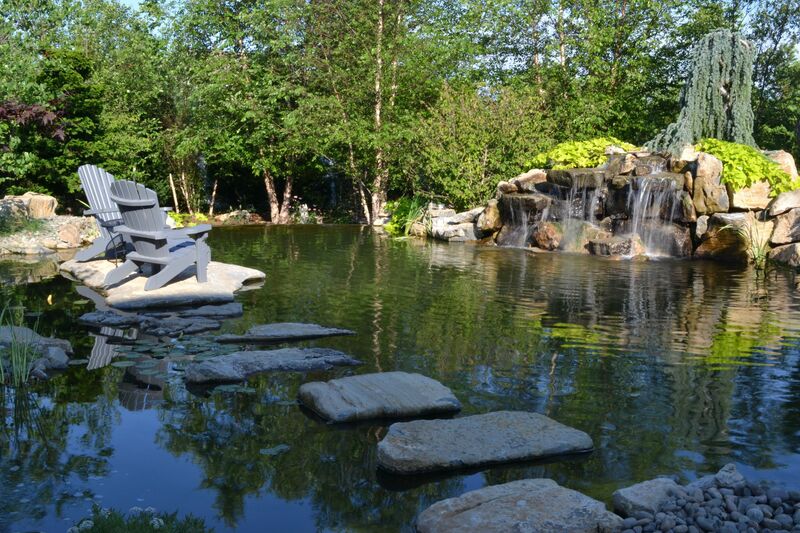 This Deck and Patio water feature includes a beautiful pond, waterfalls and stream with a bridge across it. 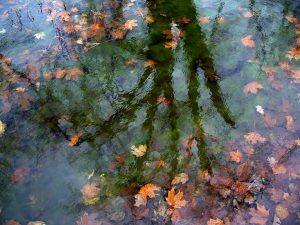 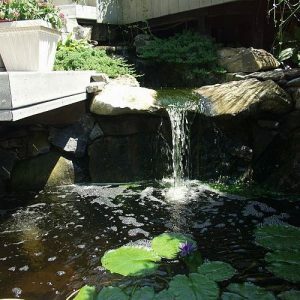 Along with the right water plants, everything works together to create a very healthy eco-system — underpinning the peaceful vistas that restore the soul. Why is this important? 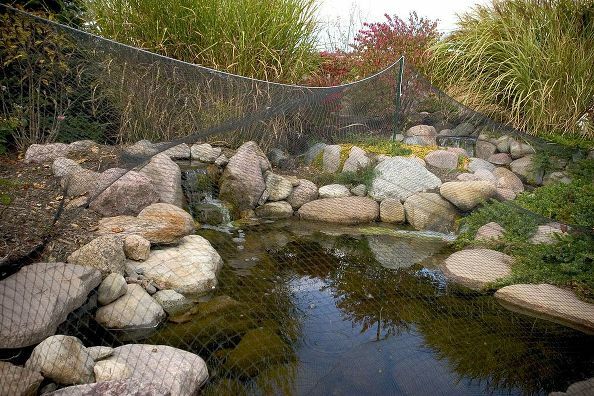 Well, such products create a total natural biological system around ponds and waterfalls that can be replenished and maintained entirely through rainfall. 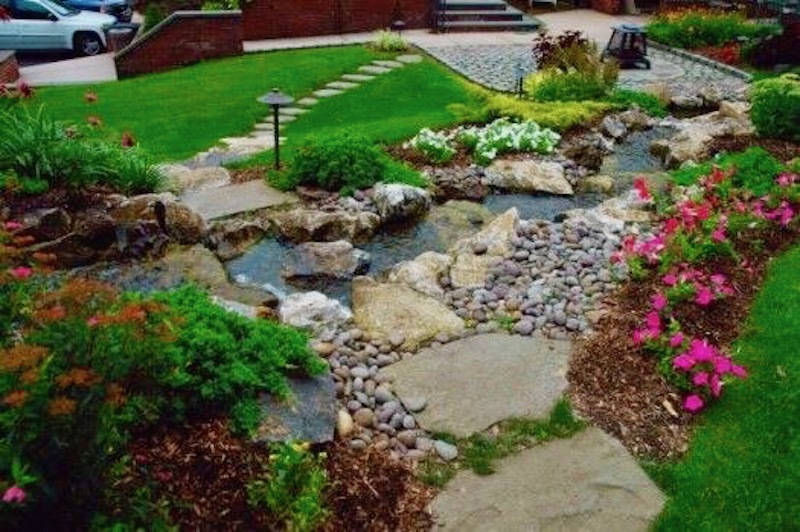 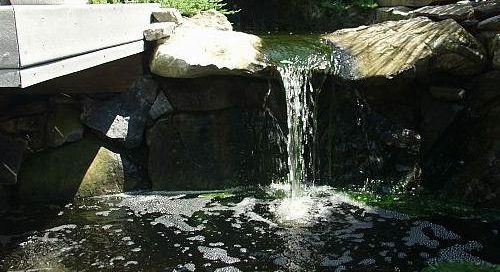 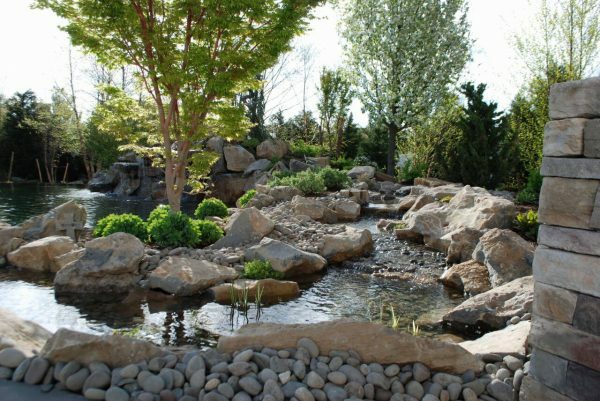 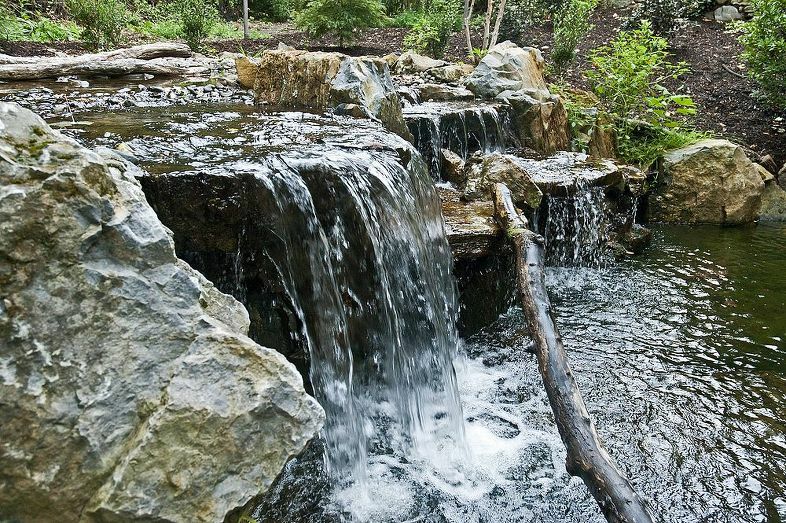 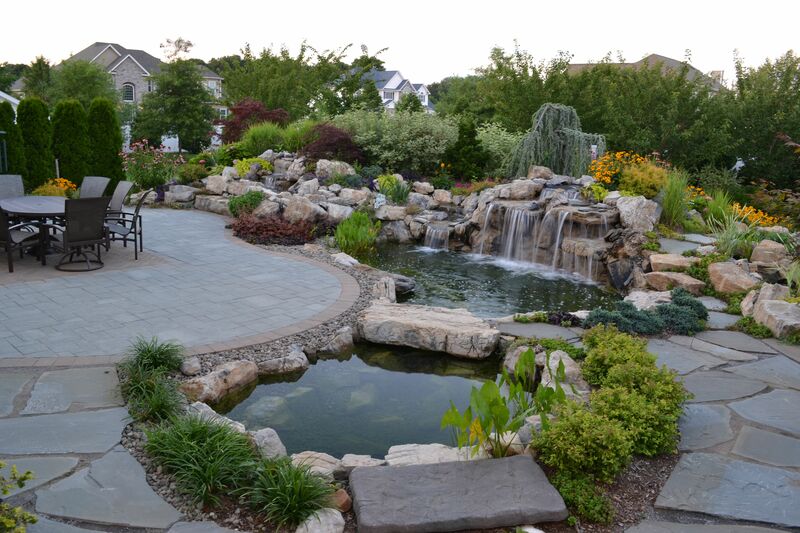 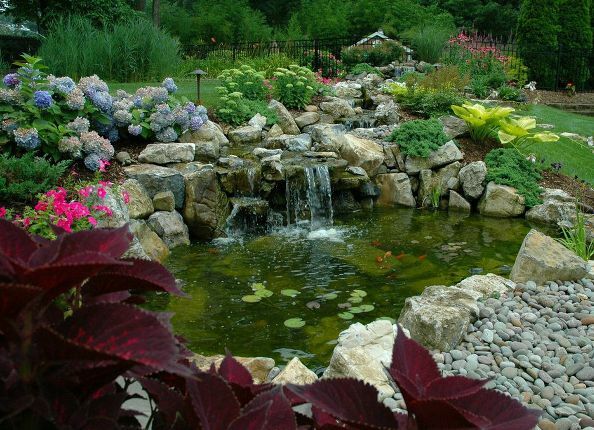 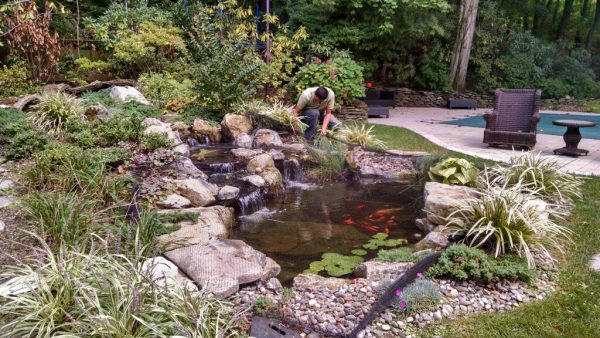 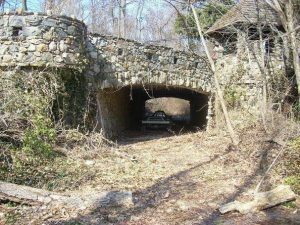 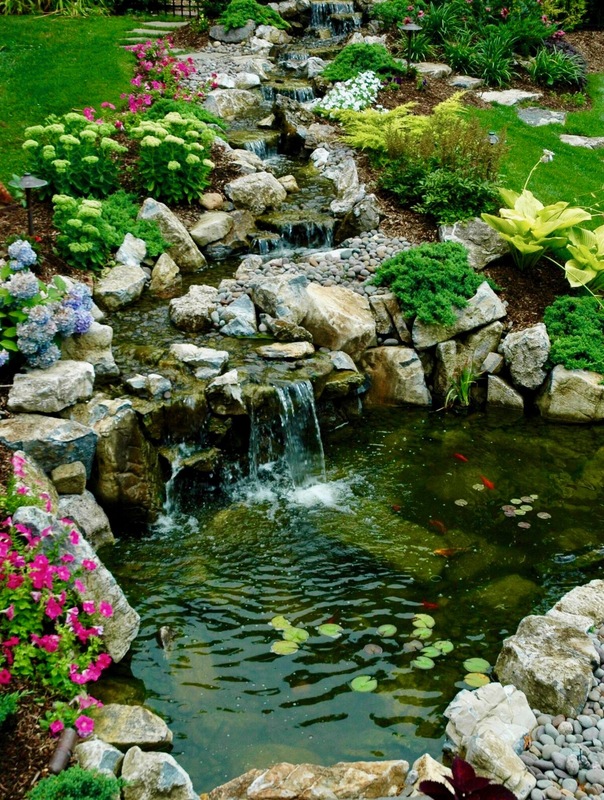 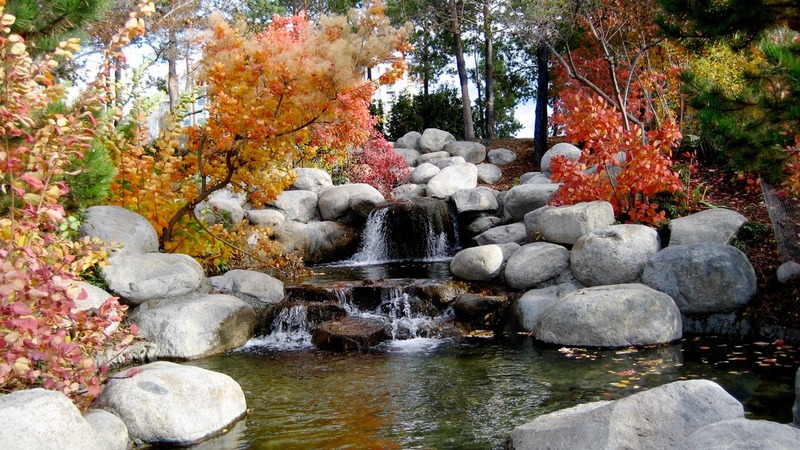 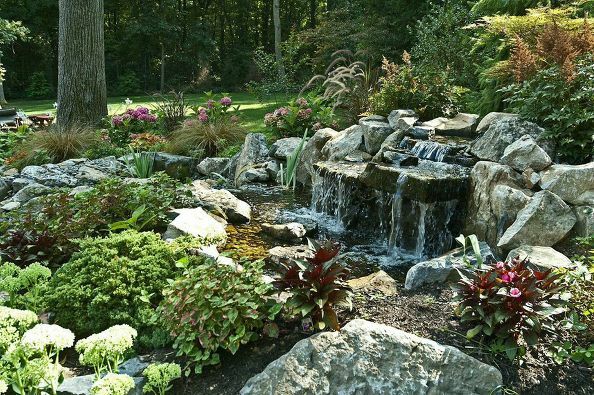 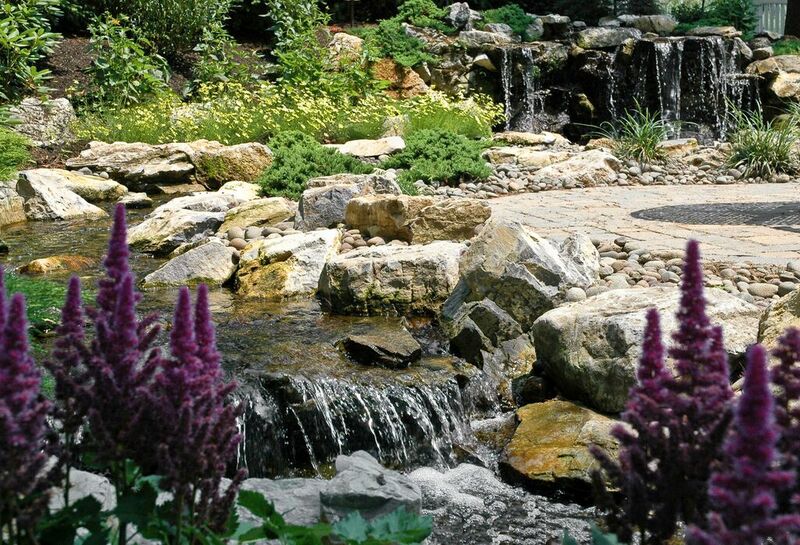 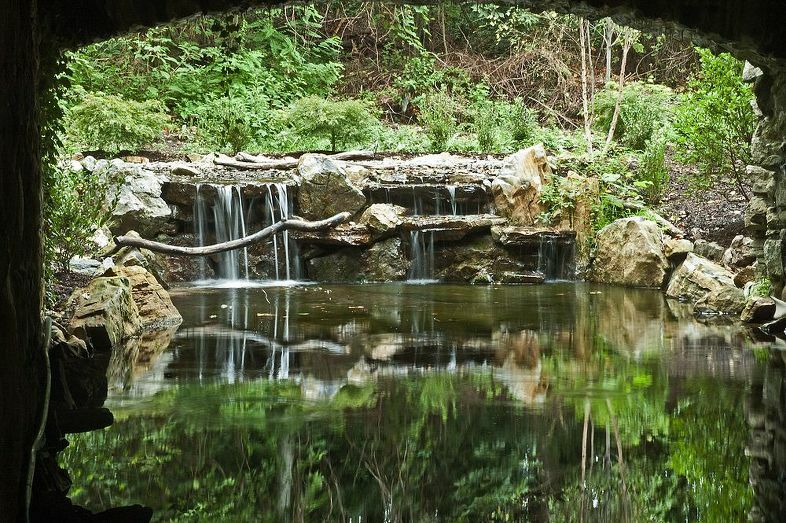 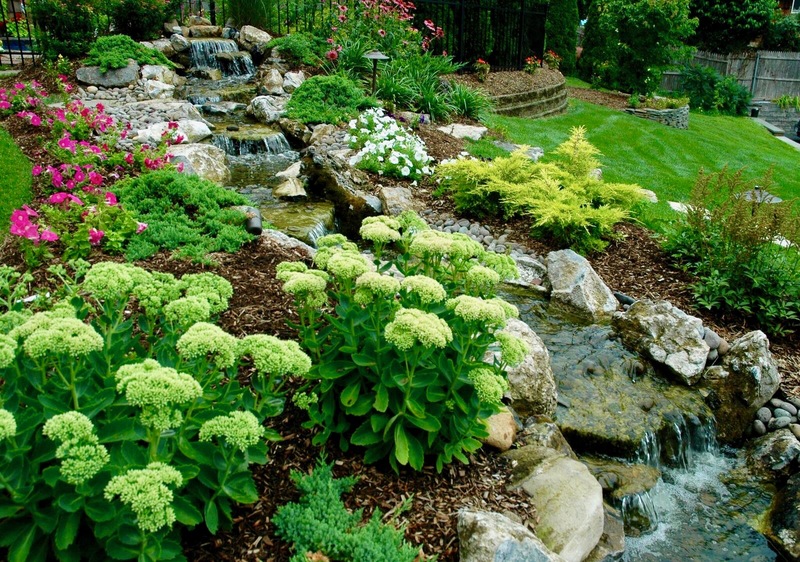 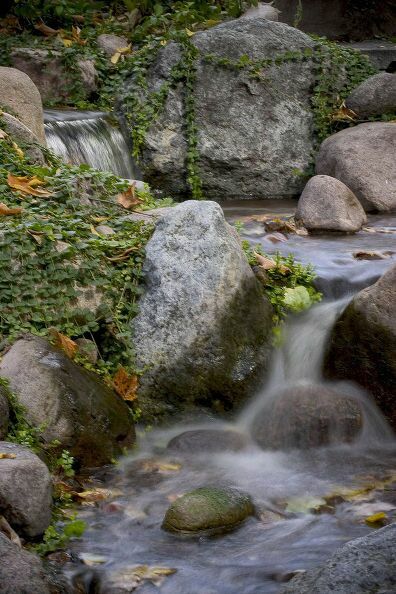 With a “pondless” waterfall, the waterfalls and stream do not drop into a pond, but seep through gravel where it is first filtered and then collected in an underground reservoir and continually recirculated. Because you are continually filtering and recirculating water, such a project is definitely eco-friendly. 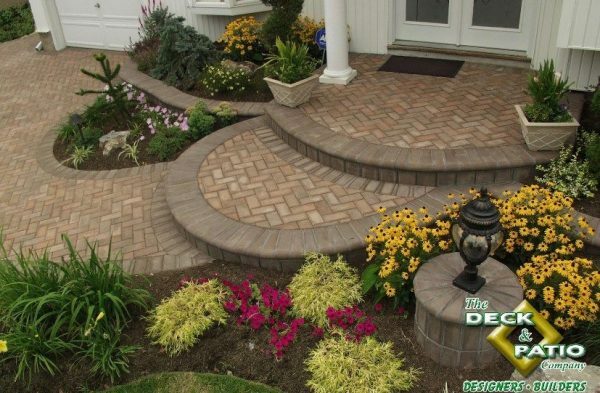 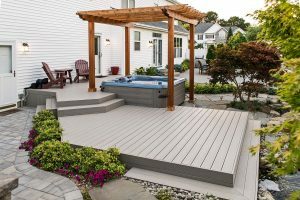 However, natural evaporation of the water feature will require, like this Deck and patio one, that the recirculating water be “topped off” and refreshed occasionally. So for those who would prefer to go totally “green” and not use any town water by even occasionally replenishing your stream/waterfall, Aquascape also makes the RainXchange reservoir system we used here. 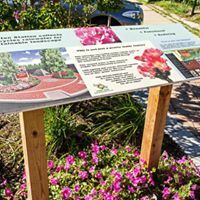 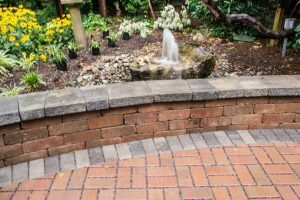 With RainXchange, runoff rainwater — either from a roof or permeable pavers — is collected to maintain the water feature’s system through completely green rainwater harvesting methods. 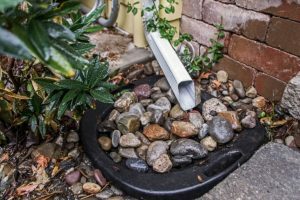 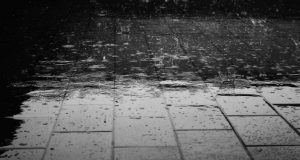 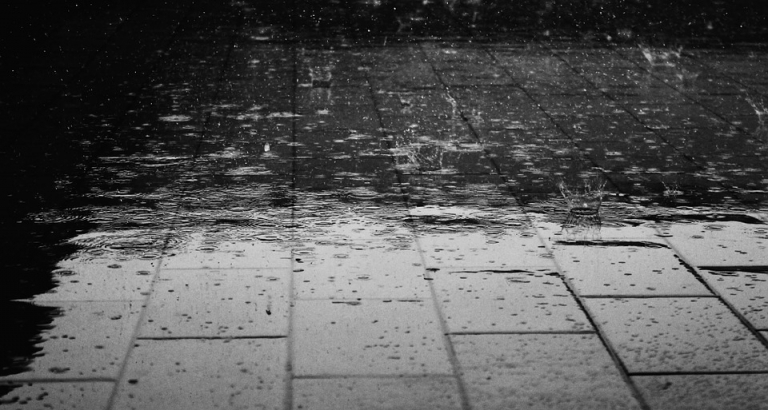 This captured rainwater can also replenish the surrounding landscape, wash a car, rinse down a deck or patio, etc., and is especially helpful during droughts. 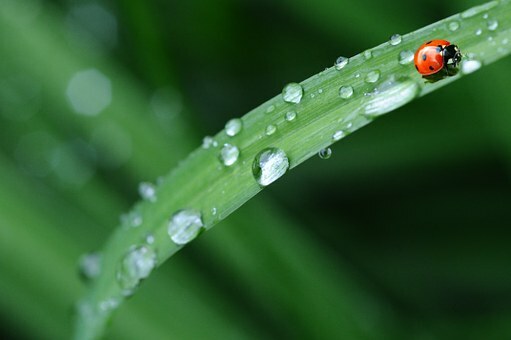 There are many routes to sustainability. 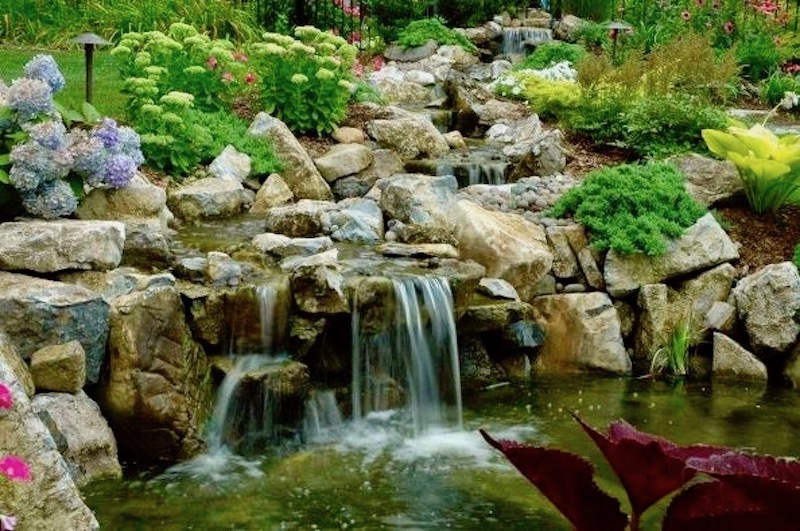 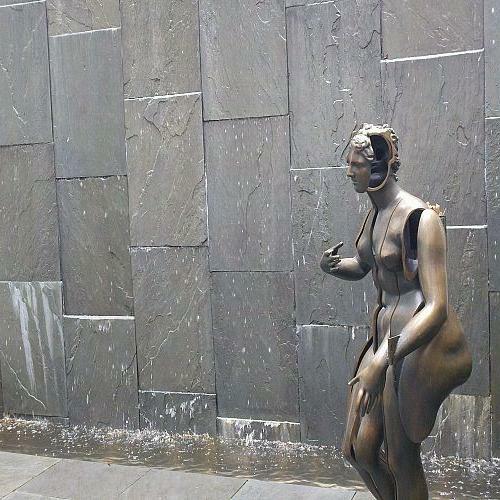 And the beautiful water feature you choose for a restful respite will be truly that…having no tinge of guilt about its impact on the environment. 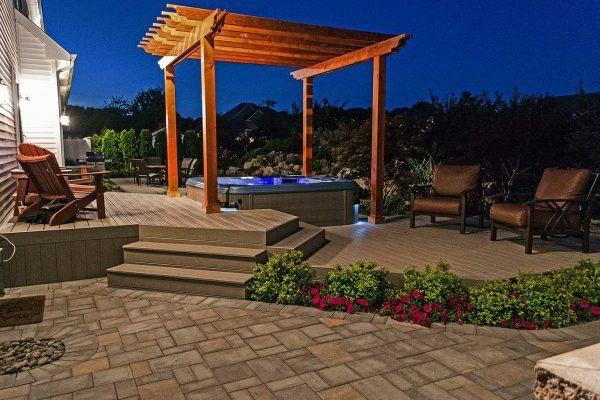 When looking for ideas to update their properties, it’s not unusual for homeowners to turn to such online social networks as Pinterest, Houzz, Google Plus, etc. 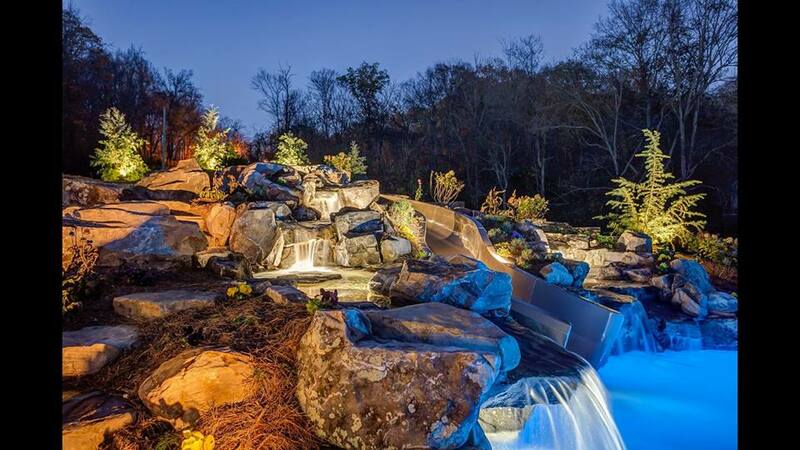 Certainly, we post our own projects on these sites and find inspiration there, too. 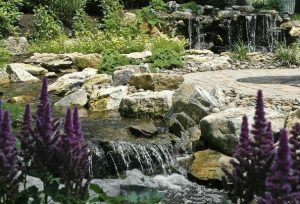 That said, our design staff gets most of its best ideas outside, when taking in vistas that we can hear, smell, and touch. 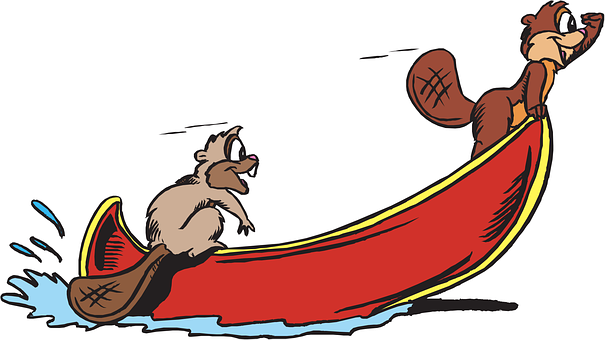 Indeed, when you’re passionate about the outdoors, you find you can’t turn off your inspiration-antenna, even when on vacation. 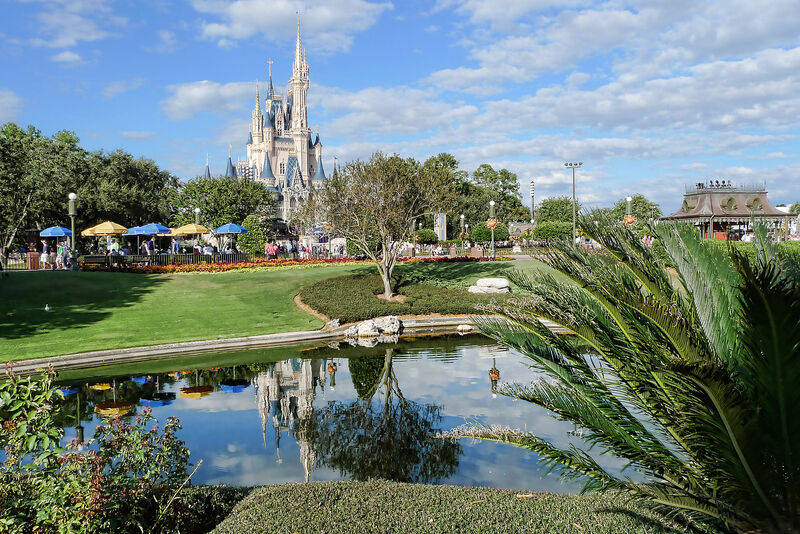 That was the case for Deck and Patio’s Bill Renter after he visited Disney World. 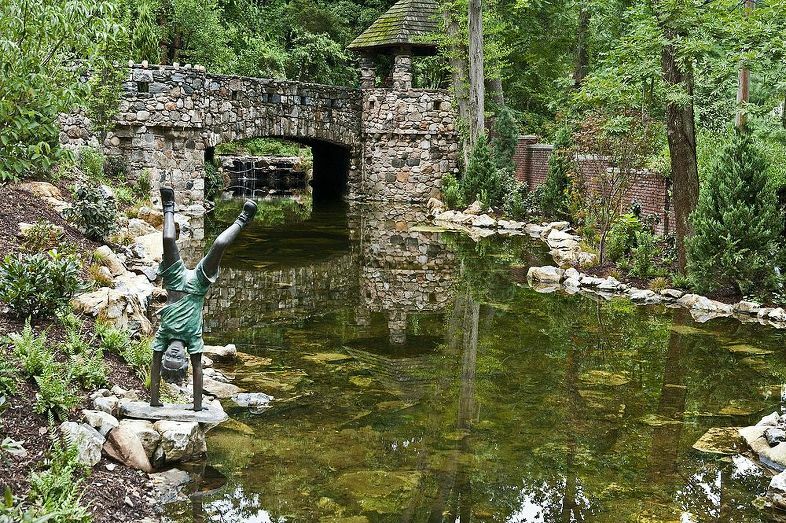 And what awed him there became the inspiration behind one of our company’s most awarded projects. 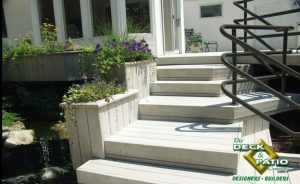 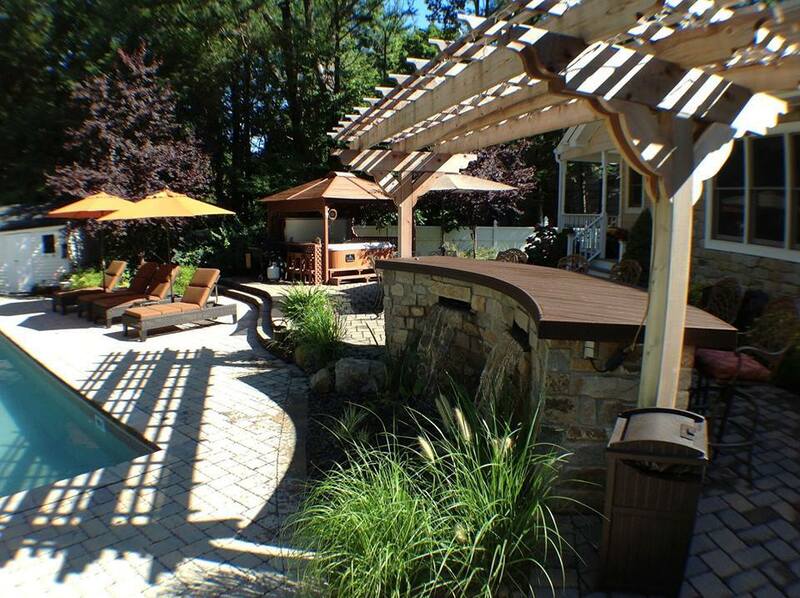 Indeed, the homeowners admit to be in awe of what Deck and Patio Co. accomplished. 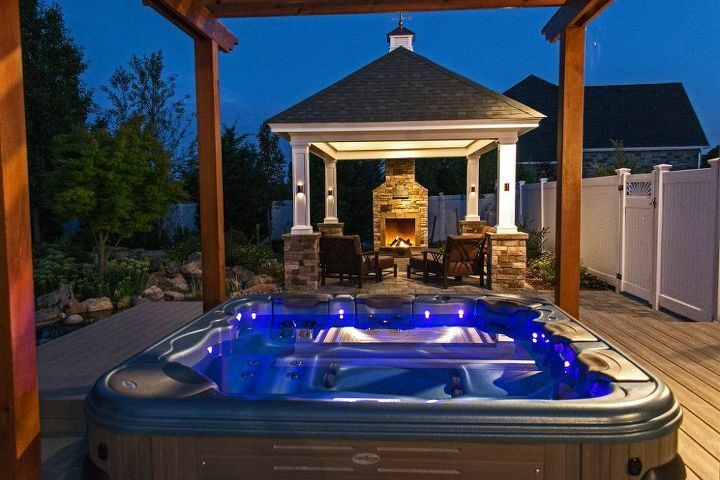 His wife loves how their new backyard “resort” offers the thoughtful comforts of many hotel/resort amenities. 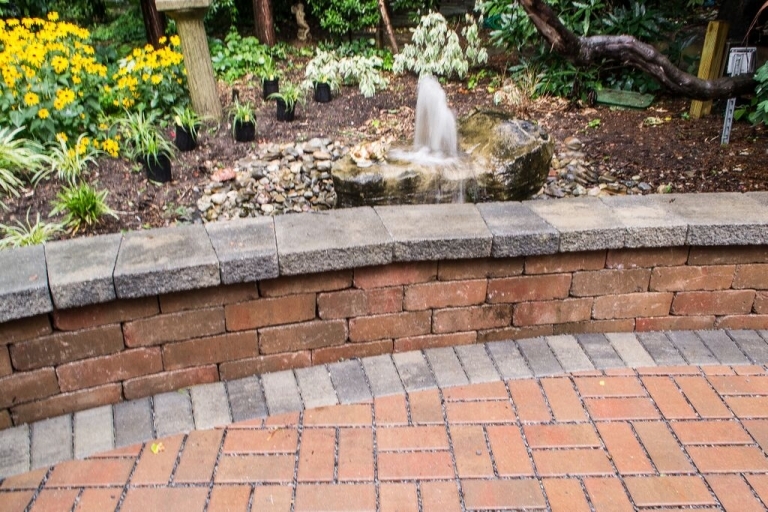 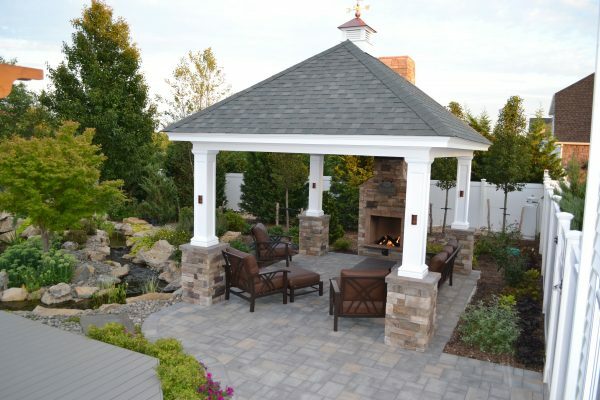 For example, four embedded umbrella stands are installed in the main tumbled stone patio. 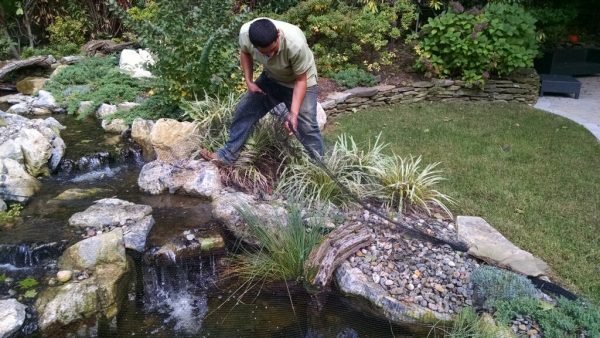 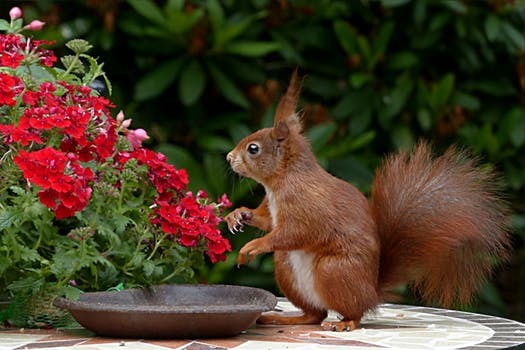 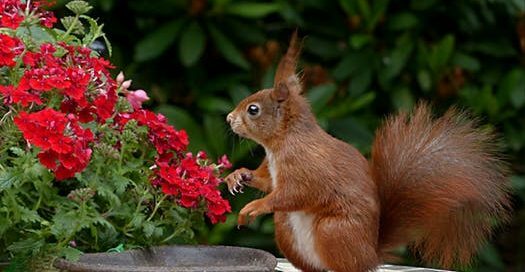 Landscaper Renter has also successfully mimicked the background music at hotel resorts – that is heard but is never intrusive. 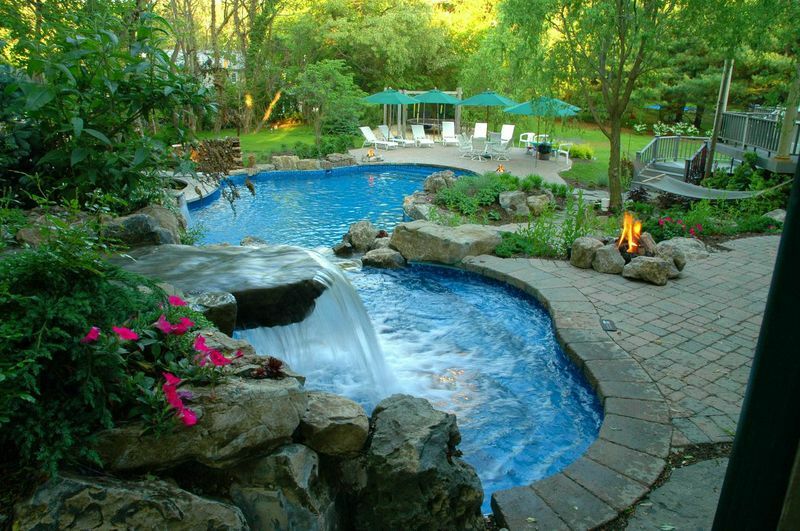 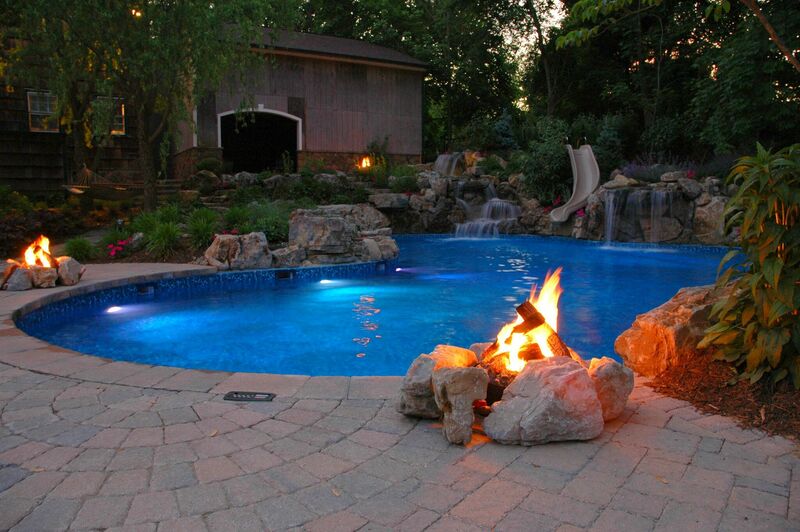 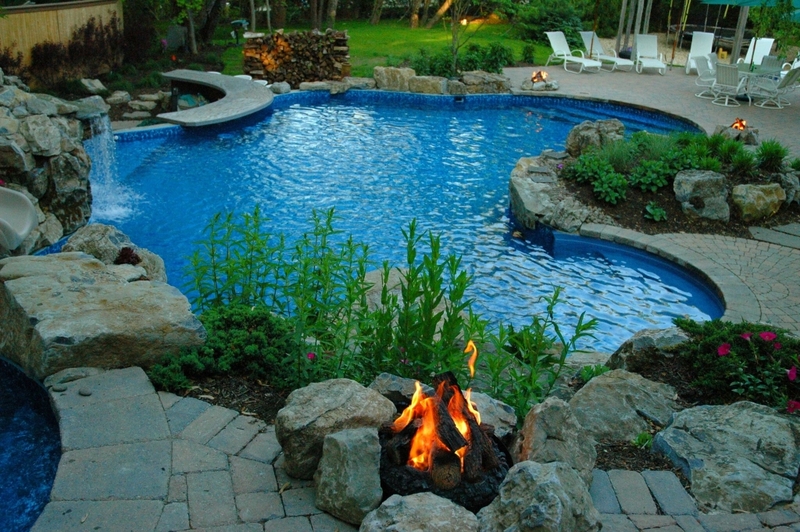 The landscaper adds that in 2005, this project also won the “International Award of Excellence – Gold Medal” – from the APSP (The Association for Pool and Spa Professionals) in the category of a vinyl pool in excess of 601 square feet. 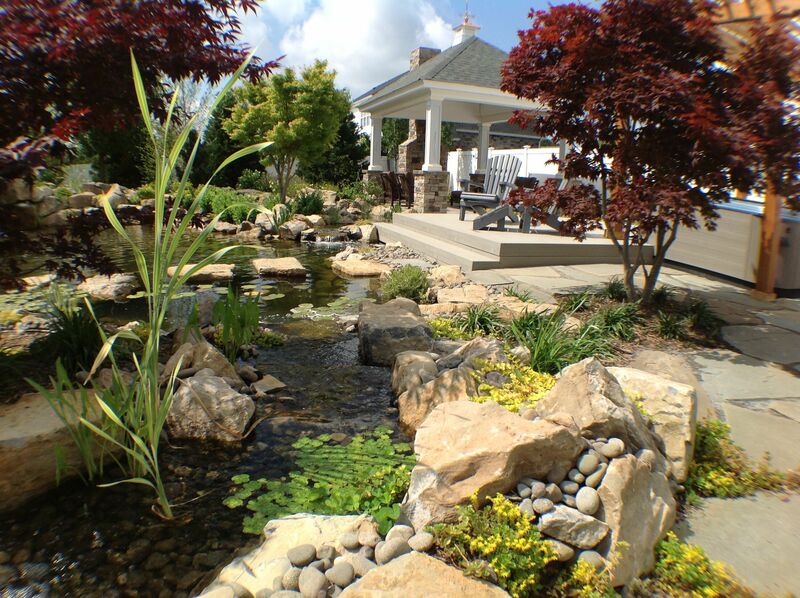 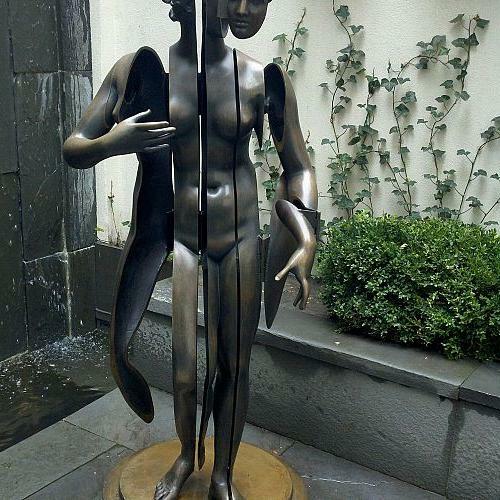 Yet, a beautiful as the completed project is, the awards were given for more than just what meets the eye. 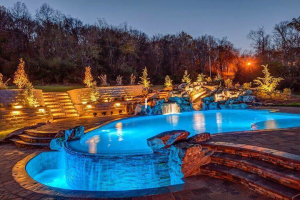 Design and execution challenges for this 46-by-32-foot free-form vinyl pool/spa began with a 13-foot elevation change that runs the length of the pool area. 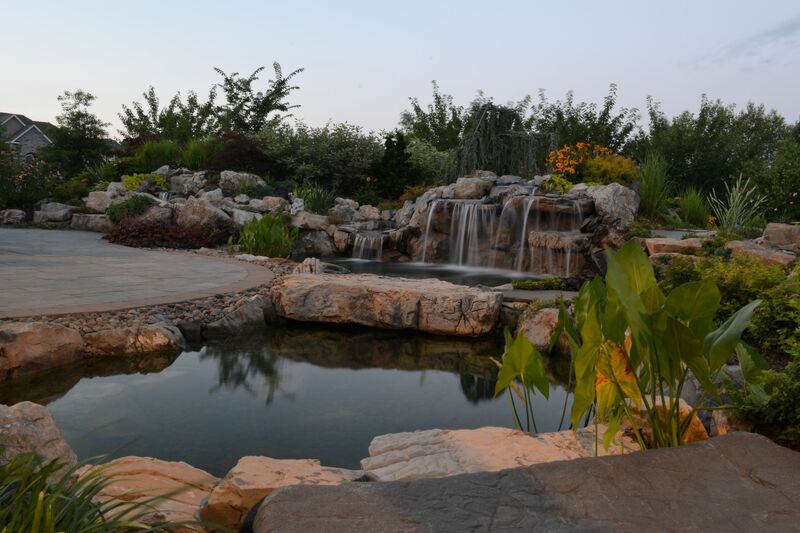 In addition to a stunning pool, spill over spa, patio area, multiple waterfalls and a swim up bar in the backyard, Renter added a gorgeous pond with waterfalls on the side of the property, just below a rolling green lawn. Renter adds that, of course, the clients love the built-in water slide, and there are five waterfalls (one reaching 7×10 feet), plus immense moss rocks — some weighing in excess of six thousand pounds. Family and friends really enjoy being able to get a cool drink by swimming up to the 38-foot “swim-up bar” that has submerged barstools. He adds that this amenity is very popular with adults, as it is a great spot for swimmers and strollers to meet and talk, without the swimmers having to get out of the water. And for nighttime entertaining, the automated color logic lights, the ten speakers that pick up commercial-free satellite radio, the glorious 7×11 foot vinyl-lined spa, and the romantic gas campfires, make this anyone’s definition of nighttime paradise. Away from all the activity the pool area generates, these clients now have a gorgeous spot for meditation that includes a fish pond. 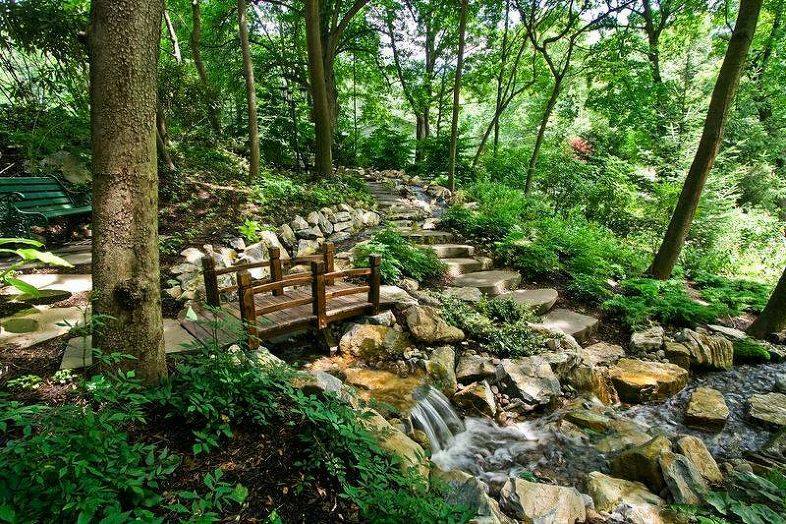 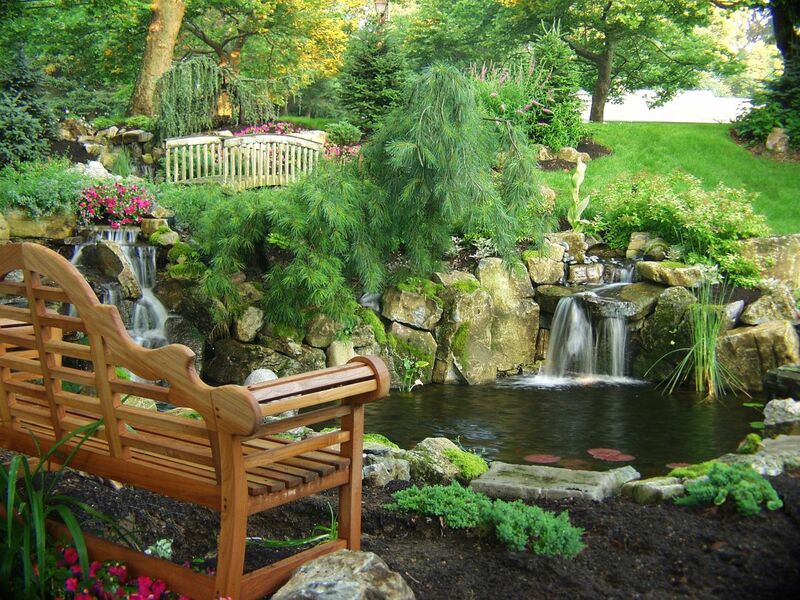 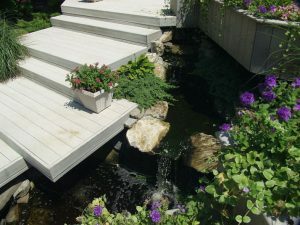 wooden bridge, multiple waterfalls, lush plantings and garden bench. 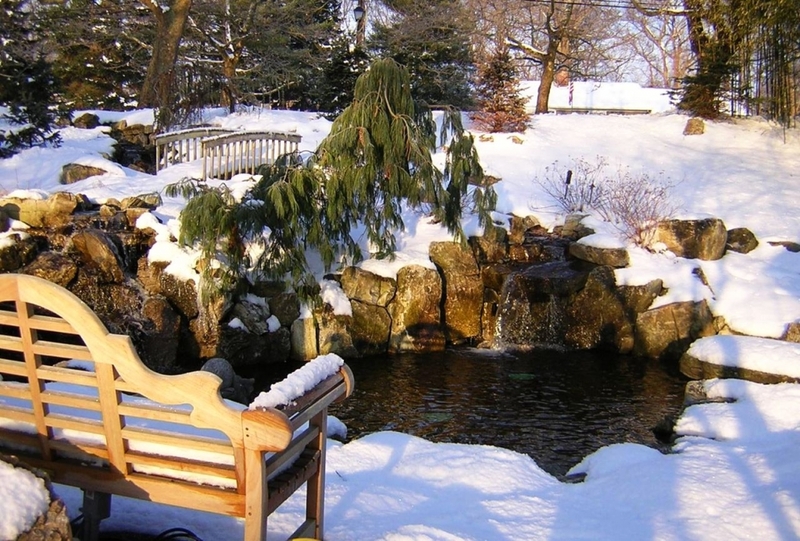 Even after the snow falls, these clients find they can’t resist stopping by their pond and enjoy quiet moments alone with nature.